A chance encounter at a museum perhaps, or maybe they were set up by friends; it could well be a meet-cute at a laundromat, or the classic high school sweetheart/girl-next-door story. It’s one thing to be experiencing all of the headiness first-hand, but it’s another thing to watch it all happen on the outside. And that’s what K Sajeev Lal does. He’s a grand orchestrator in the process of matchmaking — or rather, a photographer. Sajeev owns a photography studio in Little India, which he bought over a long time ago for $7,000. Over the next decade and till present, he and his wife Sheeja Shaj have run the studio together. His main clientele? Young male foreign workers from Tamil Nadu and Sri Lanka, who send their portraits back to their parents in South Asia to look for brides. Business model done right? I think so. 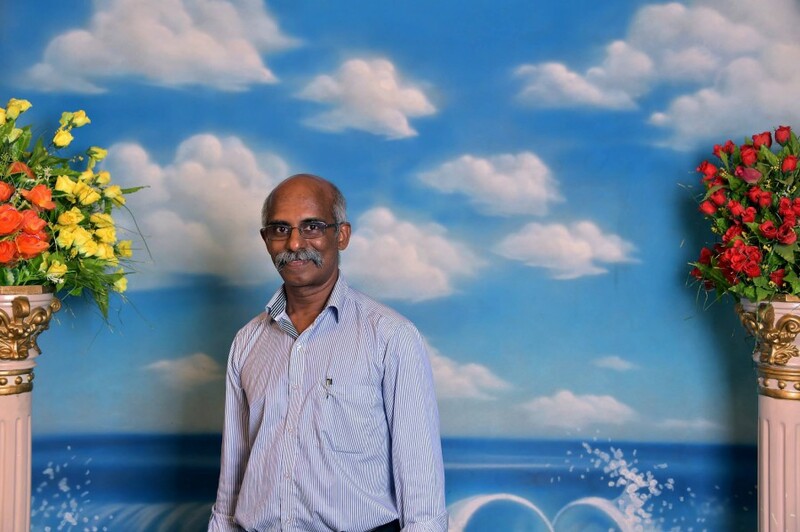 Ravi — one of his customers — for example, had been taking portraits in different studios but had no luck in finding a wife. He decided to go for one of Sajeev’s sessions, and then…success! “I got married last year, after sending my portrait back home. I’m very happy with the result,” he said, smiling. He also added that the process was simple: Sajeev did not direct them on how to pose or what to wear, he simply asked them to pick a background, and props and clothes in the studio were available for use if they wanted. No pressure at all. While it all seems colourful and sunny, Sajeev revealed that the Little India riots in 2013 had affected business at the studio. The location of his studio is also just around the corner from where the incident happened. “Before that, on weekends I usually get a lot of customers coming in all day but now, because of the curfew and all, it’s much lesser already,” he tells us. It’s sobering to realise the that the resulting alcohol ban and curfew rules have affected not only businesses selling alcohol, but also other local enterprises. Before settling down with his photo studio, Sajeev was in the business of event photography — a service he still provides. “When someone offered me to take over the studio because he was retiring, I thought it was a good deal. We started with film photography first,” he shared. But times have changed; technology levelled up, and digital photography came a-knocking on his studio door. In 2004, Sajeev Photo Studio became fully digital. Sajeev revealed that it wasn’t just technological changes that drove him to make the shift. He said that even when he was shooting on film, there was already an increasing pressure to produce the prints quicker and in a shorter time. “Now I can get the pictures out in two hours, so they have time to makan first and then come back to collect their photos,” he said. It all works out. Besides efficiency, Sajeev had to go for courses to upgrade his skills, including a Photoshop one to bring his famed picturesque backdrops to another level. 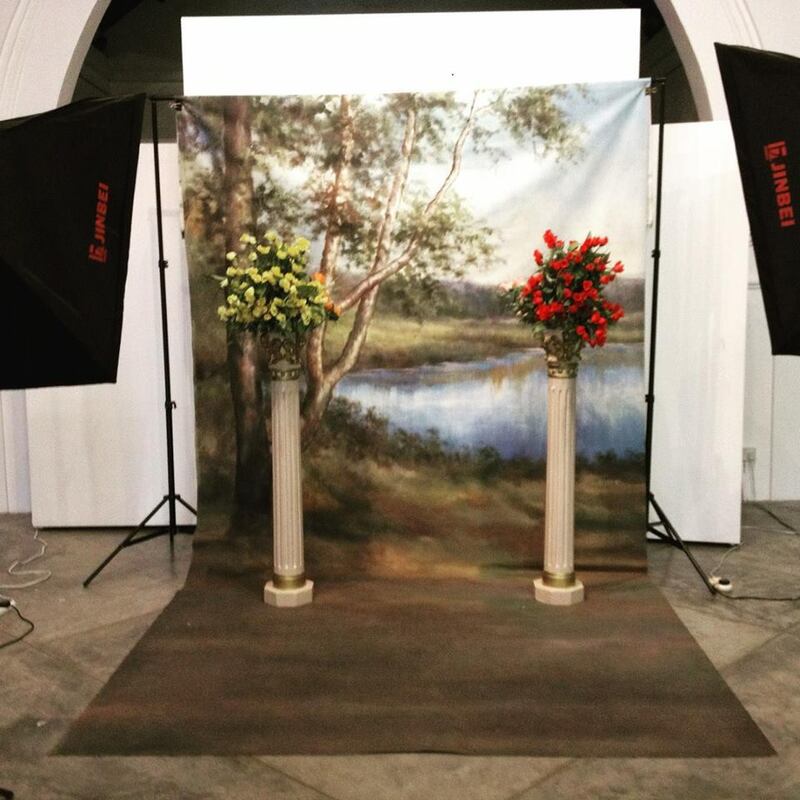 Earlier in the night, I heard someone comment on how some of the backdrops look very “China, communist-era” and Sajeev said it was because he had purchased some of them from a Chinese photo studio that was closing down. As he moved into the digital era of the photo studio, he explained how some customers chose to shoot with a blank background and then request for a specific image of their choice to be projected behind them — this would be done during the editing process. “Most of them want a Singapore backdrop to show their relatives back home the modern city they are in,” he says. 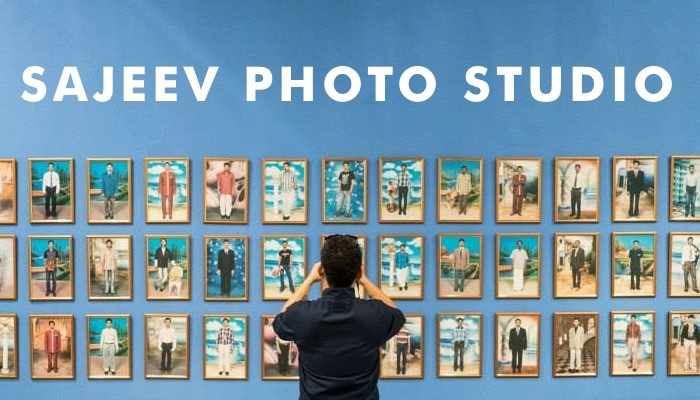 You’ll observe this as you look through the collection he has on exhibit — all the Merlions, tall buildings, scenic bridges we have in the city that make a cameo in the photos. There’s even one with an SIA plane flying in the foreground. “He asked me to add that!” Sajeev laughs. 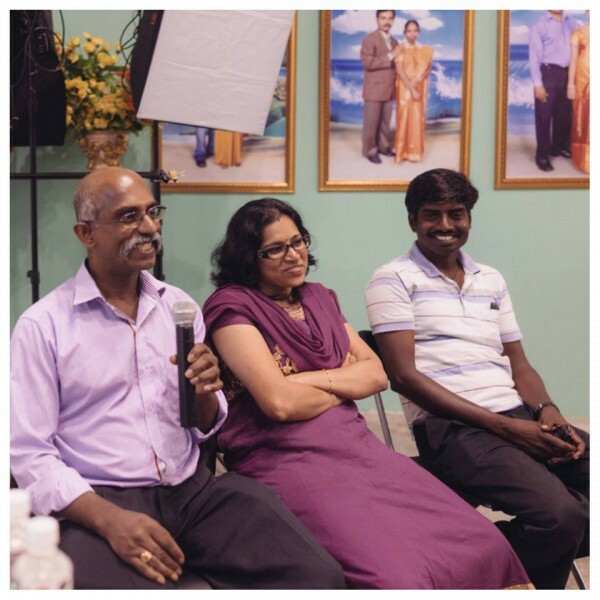 It’s no surprise that Sajeev Photo Studio became a point of interest for the exhibition A Decade of Portraiture in Little India presented by Objectifs, Centre for Photography and Filmmaking. 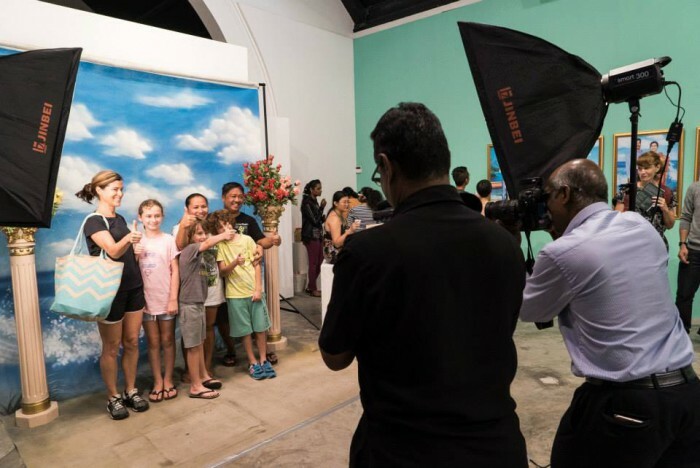 It is through the photo studio that we can examine the changing roles of the photographic portrait and photo studios, the story of the Singapore immigrant, and a little about the history of our country as well. Sajeev’s personal story is also one for the books as his wife related how they met. “He was 15 when he left for Singapore and I was just a girl in India. 11 years later I got a portrait of him as a working man in Singapore, and the rest was history,” Sheeja said. And if you thought it was a selfie he sent to Sheeja all those years ago, you might be disappointed. “He was working at the zoo at that time and sent me a photo of himself next to a kangaroo!” she exclaimed. Ah, jumping his way into her heart. They now have a son who is currently serving National Service, and like father, like son, he too has expressed interest in his father’s business, and even plans to maybe take it up a notch. “He doesn’t like to be still all the time, so he suggested exploring the concept of the mobile photo studio. The pop-up booths you’d see at events,” Sheeja said. All in for the family business. Love, romance — these things, they’ll never go out of style.